In recent decades the rise of the so-called "global obesity epidemic" has led to fatness and fat bodies being debated incessantly in popular, professional, and academic arenas. Fatness and fat bodies are shamed and demonised, and the public monitoring, surveillance and outright policing by the media, health professionals, and the general public are pervasive and socially accepted. 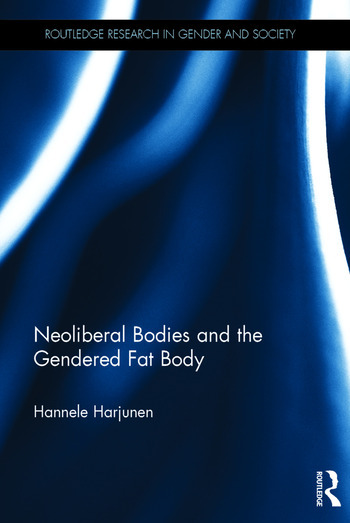 In Neoliberal Bodies and the Gendered Fat Body, Hannele Harjunen claims that neoliberal economic policy and rationale are enmeshed with conceptions of body, gender, and health in a profound way in contemporary western culture. She explores the relationships between fatness, health, and neoliberal discourse and the role of economic policy in the construction of the (gendered) fat body, and examines how neoliberal discourses join patriarchal and biomedical constructions of the fat female body. In neoliberal culture the fat body is not just the unhealthy body one finds in medical discourse, but also the body that is costly, unproductive and inefficient, failing in the crucial task of self-management. With an emphasis on how neoliberal governmentality, in its many forms, affects the fat body and contributes to its vilification, this book is essential reading for scholars of feminist thought, sociology, cultural studies and social theory with interests in the body, gender and the effects of neoliberal discourse on social attitudes. 1.1 Neoliberal Society, Neoliberal Bodies? 5.3 Wellness and Women - Buying Normative Femininity? 7.1 From Sexual Objects to Empowered Agents? Hannele Harjunen is Senior Lecturer in Gender Studies in the Department of Social Sciences and Philosophy at the University of Jyväskylä, Finland.